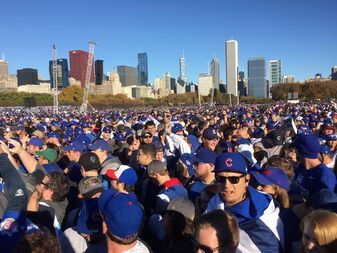 Cubs fans pack Grant Park. WRIGLEYVILLE —As the Chicago Cubs prepare to defend their 2016 World Series title, city officials have totaled up the costs for their once-in-a-lifetime run to postseason glory: $18.8 million. The final tab was released by City Hall Friday in response to a DNAinfo request under the Freedom of Information Act. The largest expense was to pay police officers overtime as they were scheduled to work more shifts and perform additional duties along with their usual assignments, said Molly Poppe, a spokeswoman for the mayor's Office of Budget and Management. Police protection for the three World Series games that took place at Wrigley Field amounted for nearly 80 percent of the total: $14.7 million. The city spent another $840,000 on overtime for employees of the Office of Emergency Management including crossing guards and dispatchers, city officials said. The tab for cleaning up after the games and celebration was another $742,000, city officials said. For the parade itself — that drew 5 million people to celebrate the first Cubs championship in 108 years — the city paid approximately $2.5 million in overtime. Cubs spokesman Julian Green did not respond to a message Friday evening from DNAinfo, but the team is not obligated to reimburse the city for any of the overtime expenses incurred to protect Cubs fans. The city saw a record number of tourists in 2016 — 54.1 million visitors came to the city in 2016, up 2.9 percent from the previous year, also a record. Officials said the Cubs championship contributed to the overall tourism spending in Chicago of $15 billion. The Cubs open the 2017 season April 3 in St. Louis.